Next to Southern dishes, Mexican cuisine is my other comfort food. When my boyfriend and I started dating, I mentioned to him I wanted Spanish food. Instead, we ate at a Puerto Rican restaurant, New York City style. I was a bit confused, because I wanted enchiladas, tacos or a dish made with corn tortillas topped with a mole sauce. It doesn’t take long to realize, his other comfort food are Dominican or Puerto Rican cuisine. When he says, “Baby, I’m bringing home Spanish food. Did you want a plate?” Now I know what to expect. 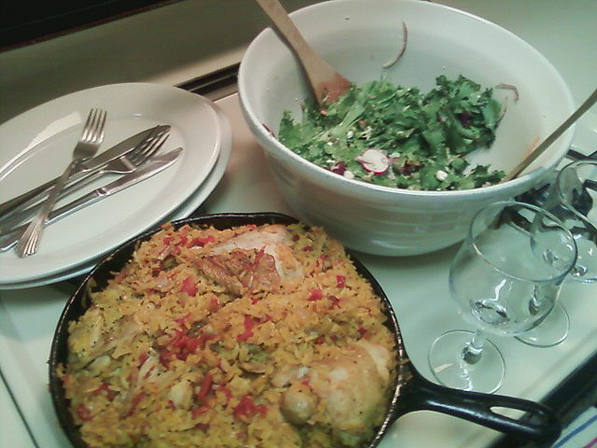 I was browsing through Williams-Sonoma’s website, when I came across the recipe for Arroz con Pollo. We had the same dish a week before at a Dominican restaurant. The blandness of the dish was disappointing at this one location. Curious, I decided to try the recipe. The boyfriend quickly proclaimed the dish as another one of my best recipes. Next time, I’ll in toss in a few green olives for more tanginess. Be aware, this dish is huge. It overflowed my 12 inch black skillet. Buen apetito! Get the Recipe at My Life Runs on Food by Sanura Weathers.